I've run a phone line from the first floor desk with ooma to my Verizon FIOS box in my basement. I want to use the ooma to power all my home phones. I have ported by Verizon number to ooma, and thus, the Verizon box itself won't have any signal. Instead, I'm trying to find where all the home phones were connected to the Verizon box, so I can tap in that way. Either by just attaching the ooma line to the Verizon box -- thus having all lines connected -- or, disconnecting the home lines to the (now dead) Verizon box and connecting them to the ooma line. Last edited by englishpaulm on Sat Nov 12, 2011 5:18 am, edited 2 times in total. Isn't there a modem or router connected to the FIOS circuit? The Telo attaches to that. Last edited by highq on Sat Nov 12, 2011 11:42 am, edited 1 time in total. 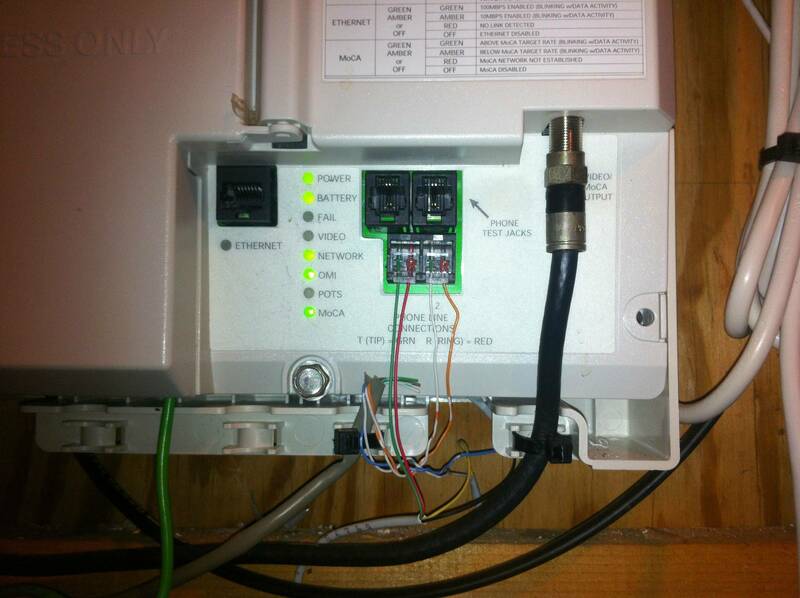 englishpaulm wrote: I've run a phone line from the first floor desk with ooma to my Verizon FIOS box in my basement. Do you want to feed the Ooma dial tone to your homes phones, or ? Are you also using Verizon phone service in your home? I've ported my Verizon number to ooma, and now want to hookup all house phones to ooma. englishpaulm wrote: I've ported my Verizon number to ooma, and now want to hookup all house phones to ooma. First you must make sure that the old Verizon phone service, and any other previous phone service that came in from the street to your house, is disconnected from the House phone wiring. Next route a phone cord from the Phone port on the Ooma Telo to the nearest House Wall Phone jack. This will feed the Ooma dial tone through out the house. If you want to use a phone near the Ooma Telo, use a phone cord splitter to feed both the House Wall Phone jack and the phone. If you have a Wall Phone port on your Ooma Telo, don't use it. thunderbird wrote: First you must make sure that the old Verizon phone service, and any other previous phone service that came in from the street to your house, is disconnected from the House phone wiring. This only holds true for the POTS and DSL service. When the technician installed a new kind of service (uverse, fios, and cable triple play, etc.) he/she probably already done this, but it doesn't hurt to double check. For the new services (like fios, uverse, and cable phone service, etc.) all the internet, TV, and phone come from the modem. For the OP, all you need to do is look for the location where the phone line from the fios modem connected to your house wiring, and replace with the phone line from ooma PHONE port. Alternatively, you can remove the phone line from fios modem and connect the ooma PHONE port to any of the phone jack in the house. Once that was done, all I had to do is plug the "Phone" jack on the Ooma Telo into an unused wall jack. Actually, in my case, there wasn't an unused one, so I put a splitter on the Telo and plugged one half into the wall jack and the other into the telephone that used to be plugged into that jack.